In the new episode of my podcast The Dan Wootton Interview – which you can subscribe to for free on iTunes, Apple Podcasts, Spotify or wherever you listen to podcasts – Evan says Diana became a second mother to the Billie Jean legend. The singer, who was 21 when MJ died, tells me: “I had a really incredible relationship with him. In the later years my mum was like a mum to him and I think some of the most special times he spent was with my mother“. Evan started his music career by singing songs to Michael down the phone. At 30, Evan is stepping out from his mother’s shadow – but he insists he never felt troubled growing up as the son of an icon. He explains: “I didn’t find the shadow tough, I feel like it’s a really special shadow to be under“. “My mum is so supportive and I think a lot of being around what I was around is what makes me so creative“. Opening up about the now infamous performance of SNL, Ashlee reveals she was desperate to pull out because she had woken up with vocal nodes. She says: “I couldn’t talk and I was like, ‘I’m not doing it.’ I’m like writing it down. And this is what you learn – you learn that when you say no you mean no“. Evan and Ashlee have a three-year-old daughter called Jagger (naturally named after Mick) – but she co-parents her nine-year-old son Bronx with Fall Out Boy member Pete Wentz. “We all get along. We lucked out,” Ashlee enthuses. All the family, including Diana, feature on the brilliant new show, which screens on E! 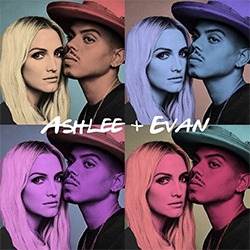 from January – but the songs by Ashlee+Evan are out now.